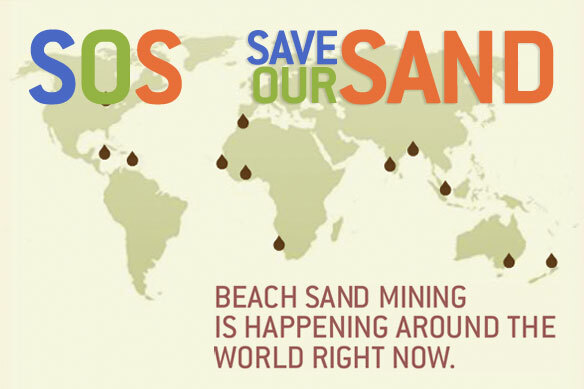 Take Action to End Global Beach Sand Mining! The petition to end beach sand mining is a non-political effort. Beach sand mining is happening all over the world. Since 2007, it has gained media attention in Morocco, India, South Africa, Benin, Liberia, Grenada, Jamaica, Malaysia, and Indonesia. Beach sand mining has also been documented in Mexico, Canada, and Australia and is happening in numerous additional countries right now. The legality of beach sand mining varies from country to country and it is illegal in many, but the value of sand on beaches is clear. Beach sand is the first defense coastal communities have against storm impacts, which are becoming more severe and more costly in both dollars and lives as a result of increasing beach development. Almost 60% of the world’s population lives on 10% of the land on the planet: on the coast. Sand is being mined from beaches for use in concrete to support the boom in coastal construction. Sand is also being exported from beaches with less development to beaches with more development, usually to replace sand that has eroded. Coastal erosion is also increasing in most areas, much of it induced by alterations to the natural beach. Barrier islands are eroding in many parts of the world and sea level rise is probably the major factor contributing to accelerated erosion. The 2007 Nobel Prize winning Intergovernmental Panel on Climate Change commissioned by the United Nations estimates the current rate of sea level rise to be 3 millimeters per year. With higher sea levels, not only will storms cause destructive erosion, but flooding from simple high tides with on-shore winds will occur with greater frequency. Additionally, natural beach sand is the foundation for a functional ecosystem. Without sand, plants can not grow. Without plants, animals can not find food and make homes. Without vegetation, the shifting sands have little hope of becoming stabilized. Beach sand mining must end or we will systematically destroy our planet’s beaches. This petition will be sent to leaders of various countries and also to the United Nations Environment Programme.